Helen Bevington (1906-2001) was born and reared in upper New York State, but her career as a writer really began when her husband, Merle, joined the English faculty at Duke University in 1942, and they moved to the outskirts of Durham. She began writing, she once said, “Because of the particular pleasure of living in the country in North Carolina.” Her career was launched when she won a poetry contest sponsored by Houghton Mifflin. In 1946 she published her first collection, Doctor Johnson’s Waterfall. She is best known for light poems that are witty and polished and marked by a disciplined grace. Her themes often come from her wide reading, her extensive travels in Europe, or the landscapes and lifestyles of her adopted state. Although she refused to take herself seriously as a poet, her poems often strike a somber note. In a memoir of her childhood, Charley Smith’s Girl (1965), Bevington tells of her youth in upstate New York, where she was born in her grandfather’s Methodist parsonage. From high school she entered the University of Chicago for a degree in philosophy, then earned a master’s from Columbia with a thesis on Thoreau. While teaching at Bedford Academy, she met Dr. Bevington, whom she married in 1928. He died in 1964, but Mrs. Bevington, who had returned to the classroom in 1943, began teaching English at Duke, writing regularly for the New Yorker and the New York Times Book Review. Like Doctor Johnson’s Waterfall, another volume, Nineteen Million Elephants (1950), is made up of poems that treat, with high humor, the things that attracted and amused her in both books and everyday life. Her third volume, A Change of Sky (1956), won the Roanoke-Chowan Award and was listed by the New York Times among the outstanding books of the year. When Found, Make a Verse (1961) contains favorite quotations, original verses, and short prose commentary. In 1974 Bevington published Beautiful Lofty People, lighthearted essays and poems about writers and poets, for which she received the Mayflower Cup. Her three autobiographical books are The House Was Quiet and the World Was Calm (1971), about life at Duke between 1942 and 1956; Along Came the Witch (1976), her journal of the 1960s; and The Journey Is Everything, A Journal of the 1970s. 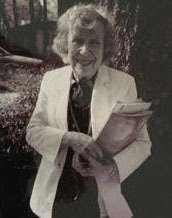 She and Burke Davis were awarded the North Carolina Award for Literature in 1973.